Ilayathalapathy Vijay has once again exploited his singing talent. The Tamil actor, who has lastly recoded 'Google Google' song for his Thuppakki in Harris Jayaraj composition, crooned a song for his upcoming film Puli. Devi Sri Prasad has recently recorded the song with Vijay in his studio. Kaviperarasu Vairamuthu has penned the song for this Chimbudevan directorial. 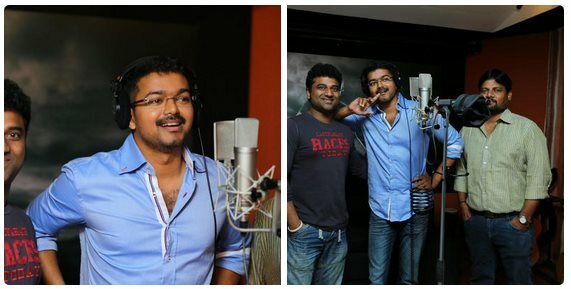 “The song crooned by Vijay was recently recorded. It has come out very well. It was at the behest of music composer Devi Sri Prasad that director Chimbu Devan convinced Vijay to sing,” a source from the film’s unit told IANS. Touted to be a socio-fantasy film, Puli is in final stages of shooting. Vijay's Puli casts Hansika, Shruti Haasan, Sridevi, Sudeep, Prabhu and others in pivotal roles.